The Life Fitness E3 is a great choice among the company's high-end, gym quality machines, as it offers all of the features you expect from a commercial brand, yet tailored for home use. The E3 is solidly built, with a dark gray frame and everything else in jet black. You have your choice of two consoles, the basic Go and the more advanced Track +, depending on your fitness needs. Get the popular E3 Crosstrainer on sale now at the LF store! 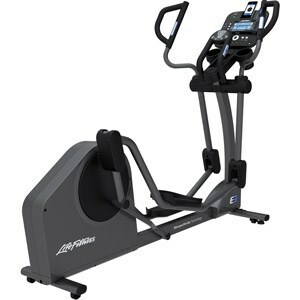 The Life Fitness E3 elliptical has received solid reviews since its introduction. It is part of their mid-range series, along with the X3 Cross Trainer, which is also a very popular model. The E3 is a little more expensive, but it has more features than the X3. For starters, you get cushioned pedals. You get a higher max user weight: 400 lbs. vs 350 lbs. You get a lower step on height of 6 inches for easier entry. You also get multi grip handles that allow you to choose the hand position that is most comfortable for you, or switch it up as you work out. One of the most appealing features of any Life Fitness elliptical trainer is the natural motion, a hallmark of the company's cardio equipment. Their machines are ergonomically designed to provide the most comfortable feel, the way your body is supposed to move, so your workouts are maximally effective. You also get WhisperStride technology with the E3, making it extremely quiet to use. That way you don't disturb anyone else while you use it, and it won't drown out the sound of the TV or radio. Another great feature not found on most models is Coach Zone, a program that helps you target different muscle groups. It actually guides you through your workout and helps you hit those areas you need the most help with. You get a fixed stride of 20", which is fine for most users...if you want a little more flexibility you can upgrade to the X5 which offers an adjustable stride up to 24". There are plenty of resistance levels to ramp up your workout as well. The E3 cross trainer also comes with a free wireless chest strap for heart rate monitoring, which gives you a more accurate reading than the grips do. There's a choice of two consoles, the basic Go and the advanced Track +. Most consumers reviews mention how the capabilities of the Track + make it well worth the extra few hundred, and we tend to agree. 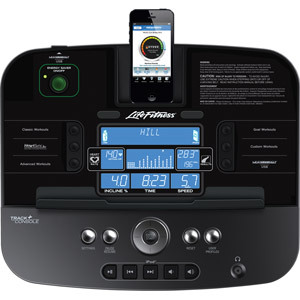 You get more workouts to choose from, 2 additional profiles, and best of all, integration with your phone or tablet so you can use various fitness apps and track your progress. All in all the E3 is a winner, and gives you plenty of versatility and programming to get you closer to your fitness goals. If you have the budget for it, the Life Fitness E3 is a solid choice. You get a comfortable, natural motion, multi grip handles, wireless heart rate monitoring, 20 resistance levels and plenty of workout programs. We think that the Track + is a better console option, not only for the additional built in and custom workouts but also for the ability to track and share your workouts and keep on top of your fitness progress. For more info and special sale pricing visit the online store!